edit: I have since moved it towards sunlight, this picture was taken right when I got it. They are one of the easiest forms of bonsai to take care of. They can be grown indoors or outdoors but they should be kept in a cooler environment during the winter months in order to get their dormancy requirement. Let them dry out between waterings. Feel the soil every day.Just stick your finger about a half of an inch to an inch into the soil. If it feels dry, water. Never let it go totally dry for extended periods. The best way to water your bonsai is to soak it in a sink or container of water up to the trunk for about 5 to 10 minutes. Then allow to drain. 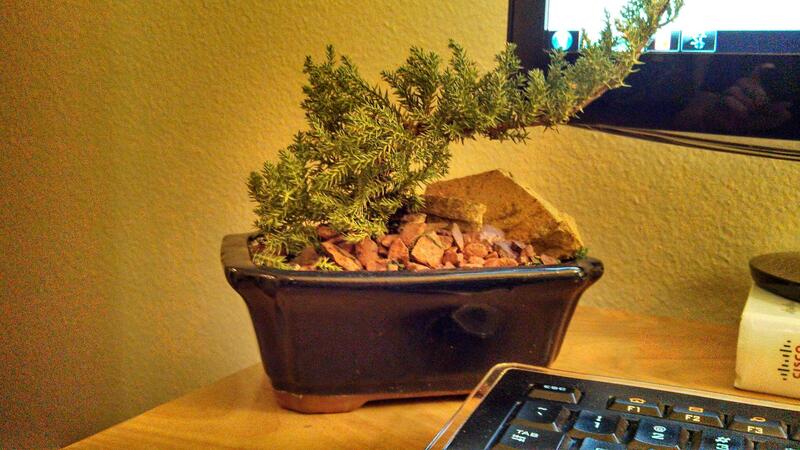 If top watering your bonsai, water, wait a few minutes, and water again. Repeat this several times to insure that your bonsai has received a thorough watering. Filtered or shaded sunlight is best. Allow low intensity morning sunlight when possible and avoid hot direct afternoon sunlight. Fertilize every two weeks during the growing season, spring until fall. An organic liquid fertilizer such as a fish emulsion or an organic seaweed fertilizer is recommended. Chemical fertilizers should be diluted to approximately one half strength so that valuable roots are not damaged. Use a humidity tray or plate filled with stones and water and place on top of the stones in the tray. Misting once a day will also help but misting is not a replacement for watering. Junipers should be repotted about every two years when young (less than five or six years old) and every three to five years thereafter. Junipers may be repotted throughout most of the year, although, the best times for repotting are in the spring and fall. After repotting, water thoroughly and keep the plant in a shady location for several weeks so that new roots may grow. Keep in a cool (under 60 degrees F) during the winter months for a dormancy period. During this period your bonsai should be protected from drying winds and extreme cold conditions. This can be achieved by utilizing cold frames, window wells, enclosed unheated rooms, or mulch beds. What's this seed? Maple? Sycamore? What is this Australian plant with small red berries? guys name of bonsai species ?, how to care? in over my head!